As time and tide wait for no man, neither do your feet adjust to hours of pounding around the robust concrete floors of Rosemont's convention center. Oy vey. But onto the cards! I spent two hours sifting through variety boxes at one of my favorite National dealers, Kurt Tourdot. Thanks to John and Len, I also spent awhile thinking about a new haircut. 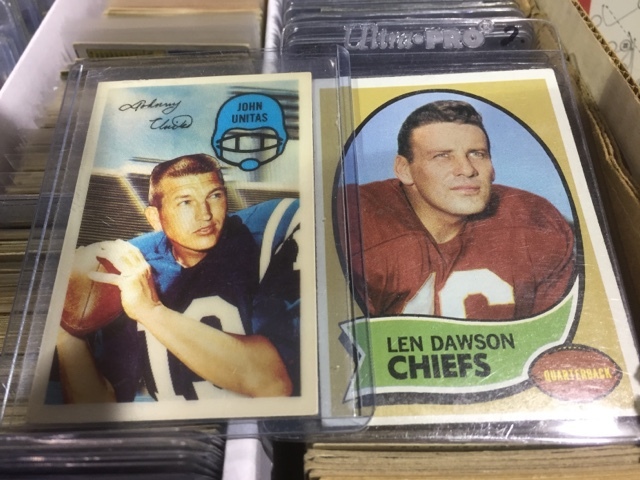 Unitas has a classic gridiron look, but Dawson's closer to what will actually happen on my head. 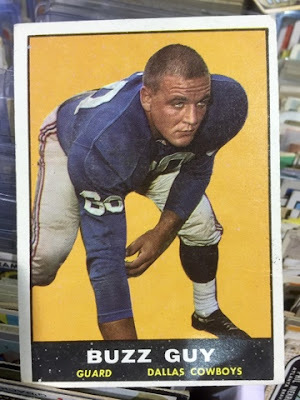 Speaking of haircuts, here's another guy with a buzz. Despite finishing my own 1976 SSPC baseball set a few years ago, I'd completely forgotten about its #589 George Brett / Al Cowans Cowens masterpiece of no-budget photography. 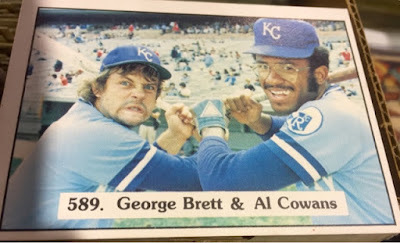 SSPC showcased several great goofball photos in the "high numbers," but I think this is the best. It's hard to find subtle, excellent design like the colors and script used for 1962 Post Cereal's CFL set. 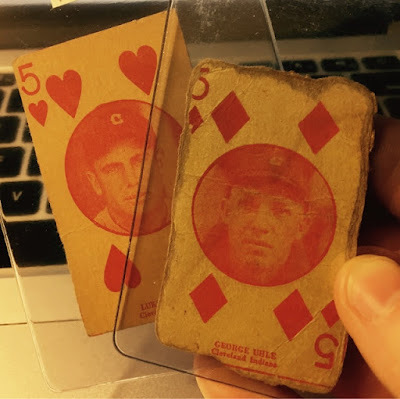 Would've loved this photo design for Post's baseball sets, which feel cramped in comparison. 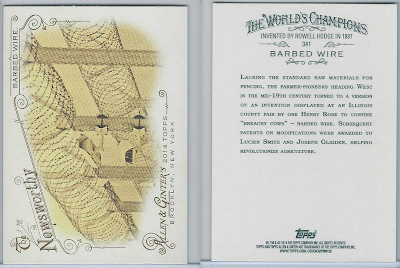 Other than last year's Allen & Ginter barbed wire card, Dan Gladden is as close as I'll get to seeing "Glidden" on a trading card. 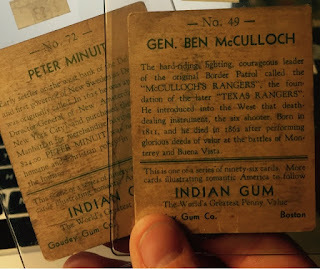 The barbed wire card, with mention of my great-great-great-uncle Joseph. 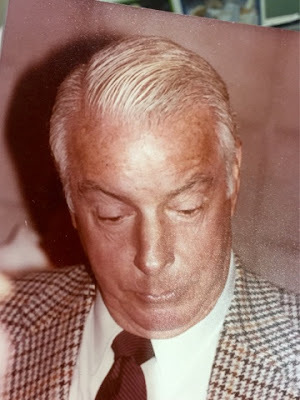 I spent an hour-plus sifting through a table of oddball postcards and photos, including this snapshot of Joe DiMaggio looking down at something. He also has a good haircut. One table featured an 800-count box of autographed 1970s minor league cards. 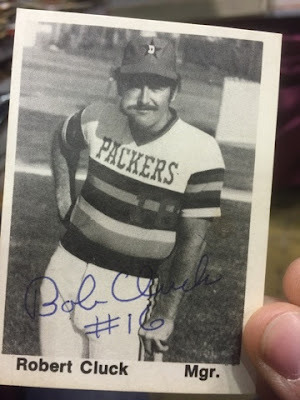 This TCMA manager card from Dubuque's Packers, an Astros farm team, was my favorite for many reasons. They are all cornball and exaggerated reasons. 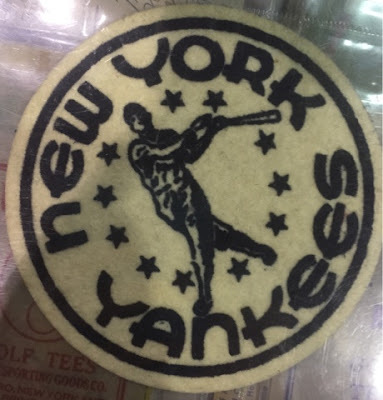 Nice Yankees patch and perfect companion to this Brooklyn patch from day one. Longtime blog readers might recall the National Poster Stamp Society's "Eureka Sportstamps" article about their Yankees promotional set. Here's another of their products, a booklet of stick-ons to liven up any kids' binder or desk or what have you. 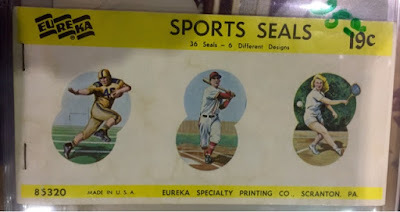 None of these seals had been sealed to anything, so I suspect it was found in storage rather than purchased for 19c by a sports or seals enthusiast. At one point, I tried to collect the 1936 S&S Game, one of the hobby's easier 1930s sets to finish. 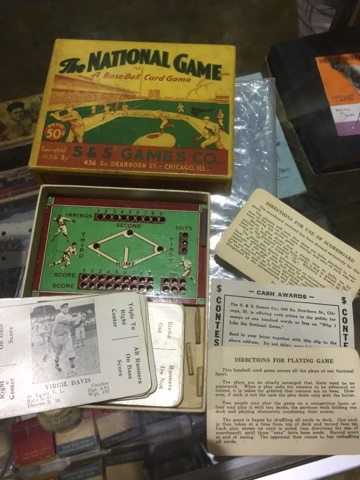 While available primarily as singles into today's vintage market, this was the source for all such cards: a boxed board game called The National Game. This game came complete with lineups, multiple rule cards, and even a "CASH AWARDS" promo that asked players to write a 100-word essay on why they liked the game itself. That last bit's some cunning work by S&S itself, since customer-written essays would give them a ready supply of marketing research and ideas. 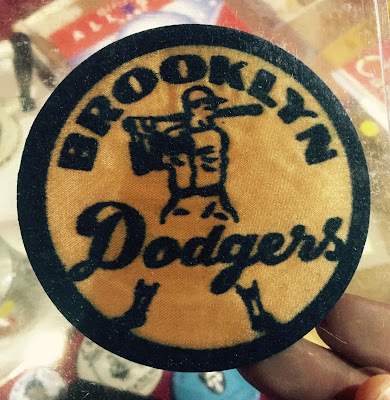 In this shape it fetches four figures, well above what I can afford on a collectible. 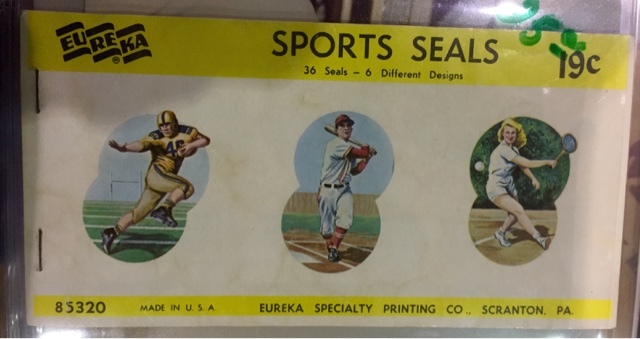 I found a few more type cards, including these from 1927-29 W560, a multi-sport set with one #5 for each card suit. 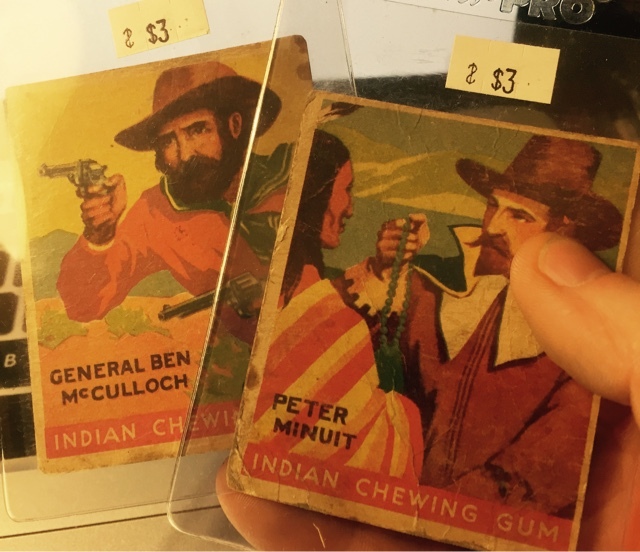 In order to better understand the explosion of the 1930s trading card market, I've also picked up more Goudey and National Chicle cards from that era, including some of Goudey's "Indian Chewing Gum," a large set about the American West. My first two Indian Gum cards ($3 each) feature a settler and a "border patrol leader," spiritual forerunner of today's Texas Rangers law enforcement unit. Clearly a good set for fans of beards. 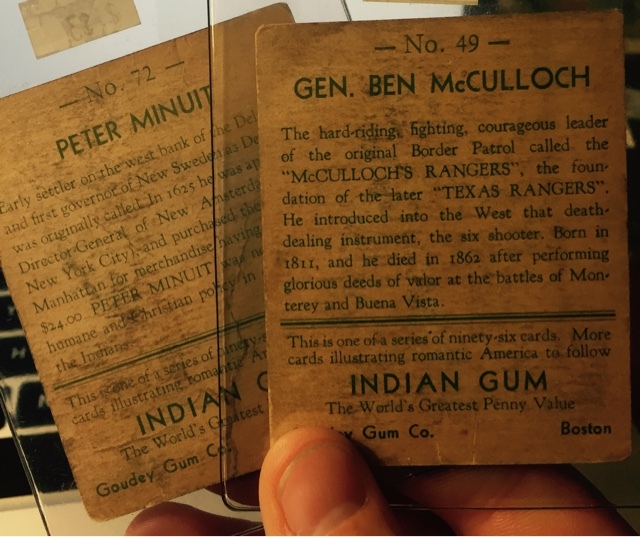 #49: "[Gen. Ben McCulloch] introduced into the West that death-dealing instrument, the six shooter..."
Speaking of six-shooters and "Indians," here's Sonny Sixkiller, Cherokee and former star QB for the University of Washington, my alma mater. 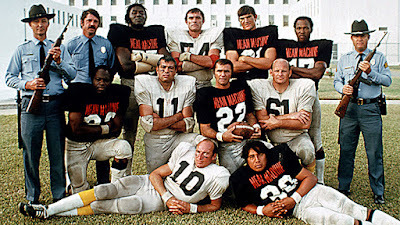 He reprised this role, kind of sort of, as a player in 1974's "The Longest Yard." Sonny's the true-life QB in this promo photo, instead of leading man Burt Reynolds, who played halfback for FSU. Sonny's career continued briefly as a pro for the 1970s WFL (which itself played but briefly) and he remains in football today as a TV analyst. 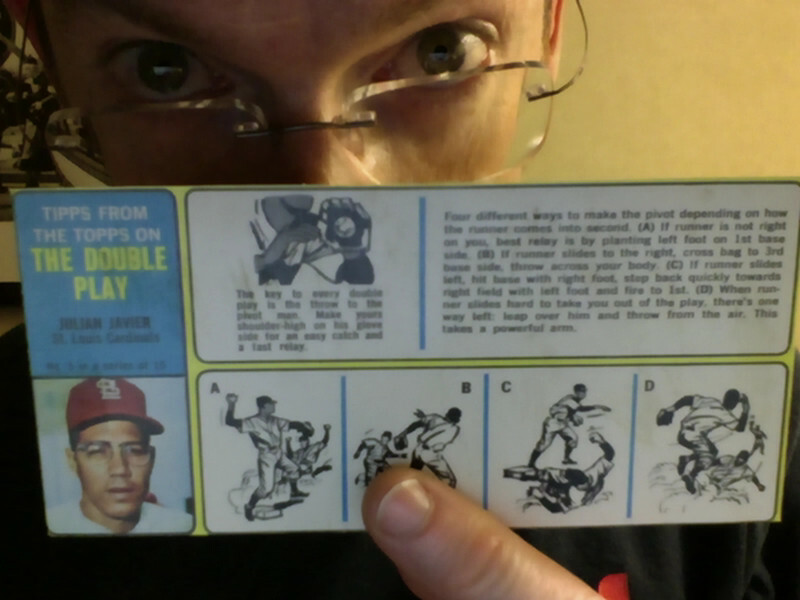 In addition to the earlier pair of W560 type cards, I also scored this 1968 Tipps from the Topps #5 panel on turning the double play for $25, starring the Cardinals' Julian Javier. 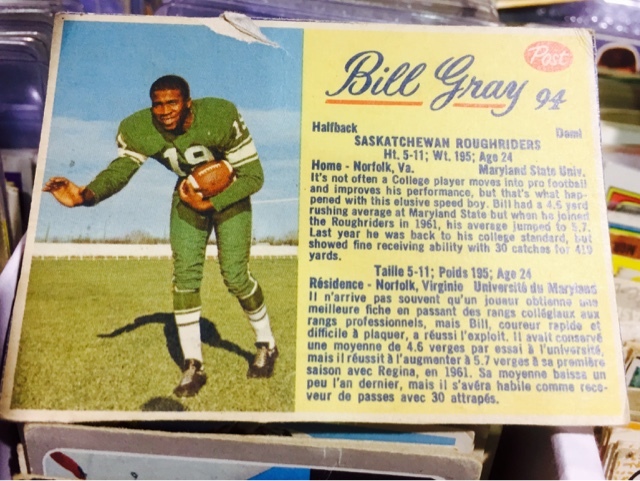 While I'd written about that set based on scans back in 2012 (set profile), it's great to finally own the real deal. 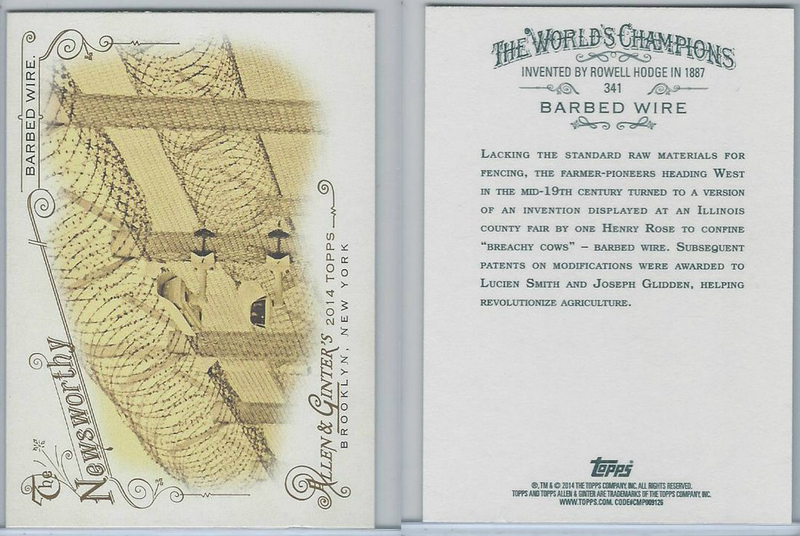 Total #5 type cards owned now stands at 550 for both major and minor leagues! I know that's far more than I thought existed when this project started. Maybe there's another handful to locate before the show's over...? Day three tomorrow! 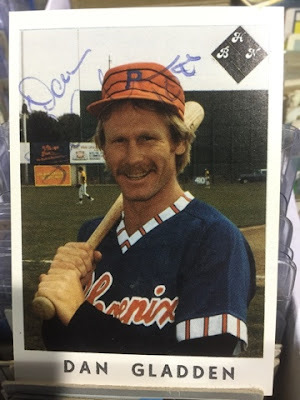 I think Joe D. is sifting through discount boxes and just discovered the Brett/Cowans card! Great stuff, most of which I never knew existed. This must be heaven. Great stuff. I especially love those Goudey cards... and that Kellogg's Unitas. Have fun tomorrow!